The Dow Jones erased a 100-point gain Wednesday to end the day just 6 points higher than where it started. What happened? 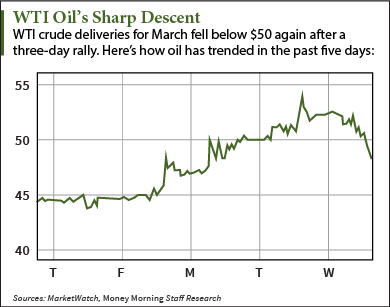 Investors turned cautious as oil prices fell once again. The S&P 500 and Nasdaq were negative today on falling energy prices and declines in the biotech sector. West Texas Intermediate prices fell more than 8% this afternoon on news that crude oil inventories rose by another 6.3 million barrels last week, according to the Energy Information Administration. The S&P 500 Volatility Index (VIX), the market's fear gauge, rose more than 5% on the day. What Moved the Markets Today: A $6.3 billion merger between two office retailer giants led the headlines on a mixed day of trading. Staples Inc. (Nasdaq: SPLS) will take over Office Depot Inc. (Nasdaq: ODP) in a cash-and-stock deal, which is expected to receive little regulatory resistance. Falling crude oil prices drove down energy stocks during the day, while shares of Gilead Sciences Inc. (Nasdaq: GILD) cratered more than 8% after the company reported mixed results for the fourth quarter. A Small (but Profitable) World: Shares of Walt Disney Co.(NYSE: DIS) surged more than 7% on news the company shattered quarterly revenue and profit expectations yesterday. The firm reported quarterly per-share earnings of $1.27, beating consensus estimates of $1.07. The company said its animated film "Frozen" boosted home video and toy sales during the holiday season. In addition, its park-and-resort operating income jumped 20% in the fiscal first quarter. Walt Disney Co. will be opening its Shanghai Disneyland park in the spring of 2016, as it expands into China. Jobless Woes: Investors offered a lukewarm response to this morning's private payroll report issued by Automatic Data Processing (ADP). In January, private employers hired 213,000 workers, which was less than expected. The news raises concerns about the January employment report to be released Friday. Across the United States, mounting 2015 layoffsare evidence of what Money Morning has been saying all along: The touted job recovery has been artificially inflated. Here's a look at a dozen recent job eliminations across several sectors and what's behind them. An Apple a Day: Apple stock hit a new intraday high this afternoon on news the company's iPhone outsold Android rivals in the United States for the first time in three years. Although Apple Inc. (Nasdaq: AAPL) beat Android by just a 0.1% margin, the company was boosted by very strong sales during the holiday season. Fed Watch: During a speech to bankers in Ohio, Federal Reserve Bank of Cleveland President Loretta Mester said she is comfortable with an interest-rate increase this year. Mester said she expects the U.S. economy to grow at 3% in both 2015 and 2016 and, in terms of rates, "would be comfortable with liftoff in the first half of this year." The speech comes a week after the central bank released its minutes from the December FOMC meeting. Earnings Slump: Shares of Ralph Lauren Corp. (NYSE: RL) fell 18% to a 52-week low after currency concerns weighed down the iconic fashion company's 2015 profit forecast. The company said its holiday quarter underperformed as its sales were affected by a stronger dollar. Meanwhile, Merck & Co. Inc. (NYSE: MRK) dipped 3.23% after the company reported that a stronger dollar and patent expirations affected its quarterly earnings report. Merck announced regulators are prepared to rescind the "breakthrough therapy" designation for its pending hepatitis C treatment due to other competitive drugs. Money Morning Tip of the Day: To become wealthy, you have to learn to ignore "the noise" and focus on "the signal." It's the hardest but most important part of investing. I often advise investors to "Separate the Signal from the Noise." To create real wealth, you have to ignore Wall Street's hype machine ("the noise") and instead focus on firms with excellent fundamentals ("the signal"). The noise is hard to ignore – it's everywhere. But it can lead you down the path to investment destruction. And most retail investors succumb… which is what Wall Street wants to happen. Take Apple Inc. (Nasdaq: AAPL), for example. Apple reported the biggest quarterly profit ever for a public company on Jan. 27. Now, instead of looking at the picture clearly, the media is making Apple shareholders worry that smartphones have reached their peak – and Wall Street seems to think the company has become too dependent on iPhone sales. All that "concern" from the media and Wall Street is "noise." But here's the "signal": Apple will continue to grow beyond iPhone sales thanks to catalysts in at least three sectors. And that'll propel the Apple stock price even higher. Go here to find out more about the AAPL price catalysts – the ones Wall Street doesn't want you to know – plus get all of our latest tech stock picks.